A modern villa with the ocean visible from its backyard, Villa Song is part of Horizon Estate and comprises spacious open-concept living and dining areas, an infinity swimming pool and three, air-conditioned bedrooms with private terrace. 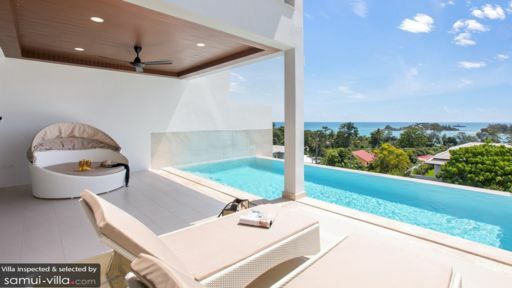 The stunning villa is located on Choeng Mon beach with access to nearby spots like Chaweng Beach, Bophut and the popular restaurants, cafes and bars. Furnished well and with utmost comfort in mind, the villa promises an unforgettable holiday with your friends and family. The staff is dedicated to make your stay worth your while and you have a horde of modern amenities available to you for a wonderful stay. 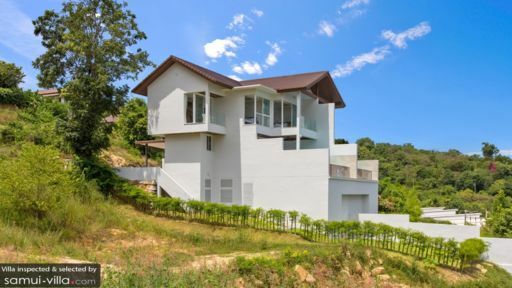 Spacious, air-conditioned and well-furnished with access to spectacular panoramas, the three bedrooms at Villa Song are nothing short of spellbinding. Slide open your glass doors and enjoy the views from your terrace. Furnished with king-sized beds, the bedrooms are perfectly designed to give you the best holiday experience. Each bedroom has a flat-screen TV as well. Ensuite bathrooms accompany the bedrooms with tranquil sunken bathtubs and/or showers, toiletries, bathrobes and other useful amenities. The crowning jewel of Villa Song is its quaint infinity pool with turquoise waters that glitter under the tropical sunshine. Relax and sunbathe on the rattan sun chairs found poolside and don’t forget your sunscreen. You can cosy up on the circular rattan daybed with a good book and lose yourself in these serene tropical surroundings. All this while stunning panoramas spanning across the azure blue ocean, open skies and luscious flora will keep you company. A spacious living and dining pavilion houses the communal areas at Villa Song that are great for times when you wish to unwind away from the direct sunlight. There is a plush, white couch for you to crash on, take a nap and spend time catching up with lost stories. For modern facilities, the living area has been fitted with a TV, satellite channels and DVD player for your entertainment so you can binge watch your favourite things. Since it is air-conditioned, you can close the glass doors and enjoy the peace and quiet. 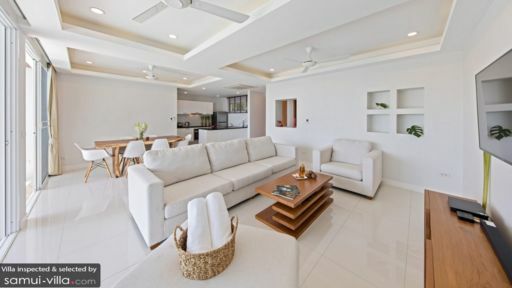 Similar to the white sand on the beach, the pristine white interiors at Villa Song are something akin to magic. There is a six-seater dining table with a unique, hand-crafted, natural wood finish table-top and minimal, white chairs for endless feasts together with your friends and family. While you relish a glass of wine and some light music once the sun sets, the sun is streaked with a myriad of colours and you can finally enjoy the cool ambiance of the tropics. Prepare your midnight snacks in the fully-equipped kitchen which has everything from a built-in oven, microwave to a much-loved coffee machine. Guests of the villa are in for a real treat as the dedicated staff will ensure you have a wonderful time that will keep you coming back for more. There is housekeeping services and pool maintenance regularly to keep the villa is great condition. Off-street parking is available if you are renting a car and for those who wish to rent a car can always request the staff. A daily breakfast is served complimentary to your stay. Choeng Mon beach is not only about its dazzling white sand or clear, blue water instead it is about the overall festive vibe and restful ambiance. There are so many activities and things to do that you will be spoilt for choice. From Thai cooking classes to visiting ancient temples like Wat Plai Laem, Treetop Zipline to a spa experience at Apple’s Spa, you have so much to look forward to.